Footbag has existed as a competitive sport in several forms since 1972. Originating in North America, it has rapidly grown into a popular amateur sport all over the world. An increasing number of international footbag tournaments and festivals are organized each year. Footbag net is a singles or doubles court game where players use only their feet (below knee) to kick the footbag over the net. The size of the court and the height of the net are the same as in badminton. The rules for doubles net are a lot like volleyball: players are allowed three kicks per side, and must alternate kicks. In singles, however, players are only allowed two kicks per side. Playing strategy is much similar to beach volley. Offence is basically done by setting the bag up and hitting it down to the opponents’ side. Good offensive players hit the bag hard while simultaneously directing it with good accuracy to an empty spot. Defence is done by either blocking the opponents’ hits over the net or moving rapidly and “digging” the bag up, preparing for counter-attack. All of this is done with feet only! Footbag net is a stunning display of athleticism. Arthur Ledain (FRA) spiking at the 2011 French Open. Photo © Etienne Ruggeri. 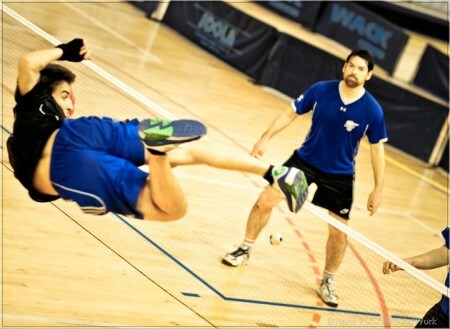 The best footbag net players are exceptional athletes. Playing on the highest level requires extreme body coordination, quickness, flexibility, endurance, etc. And these are only the physical requirements. Good game reading skills, mind control, and focus are also extremely important qualities. Footbag Freestyle is a sport in which the object is to perform tricks with the bag. It has evolved into a very technical competitive discipline. Players compete by choreographing routines, performing very difficult combinations of footbag tricks to music (not unlike in figure skating). Routines are judged along four axes: presentation, difficulty, variety, and execution. Other forms of competitive and non-competitive freestyle exist, including “shredding” in which players attempt to perform as many tricks in a row as possible, of a given add-value or above. They also attempt to show variety in their strings, along several dimensions. Each move or trick in freestyle footbag has a determinable difficulty rating. The difficulty of each move is added, and the total is divided by the number of attempted and competed moves in the routine to determine the average difficulty. Difficulty is measured in “adds”, which represent additional levels of difficulty beyond the basic moves. Competitive footbag is governed by the International Footbag Players’ Association, a charitable non-profit corporation to promote the sport. The rules, published by the International Footbag Committee, are available online and translated (or being translated) into many languages.